(single barrel whiskeys, anniversary whiskeys and more). Get there at 5 p.m. to get a drink before the tour and tasting begins at 5:15. The tour and tasting takes about an hour. executive director of the Arkansas Press Association. Inspired by the ABC News series What Would You Do?, competitors from two teams will learn about the SPJ Code of Ethics by playing editor in a variety of sketches designed to test ethical reasoning. Judges will award points for each response, and the team with the most points will win the game. Ready to compete? Email Sarah DeClerk at sdeclerk@arkansasonline.com by Friday, Feb. 9. Bring your lunch at noon, Thursday, Feb. 15 at the Arkansas Press Association, 411 S. Victory St. in Little Rock, and hear multimedia journalist Polly Irungu share how she’s built an online following of almost 40,000 people on Instagram and more than 14,000 on Twitter. Online editor Gavin Lesnick will present some best practices for journalists on how to use social media to reach an audience. Polly Irungu is an online intern at the Arkansas Democrat-Gazette. She most recently worked as a social media intern for NPR in Washington, D.C. In college she was a social media producer and digital content creator for the SOJC’s Communications team, a campus editor-at-large at The Huffington Post and a freelance production assistant for the PAC-12 Networks and Fox Sports. She has worked for TrackTown USA, Def Jam Recordings, EP Entertainment LLC, Artistic Outlet Media, Dell and Adobe. Gavin Lesnick is the senior online editor at the Arkansas Democrat-Gazette. He oversees editorial content on the newspaper’s website, arkansasonline.com, including web-first updates, email newsletters and social media. He’s helped grow the newspaper’s online following and increased its number of website visitors. Before becoming editor, Lesnick worked for five years as an online reporter specializing in multimedia and breaking news. He lives in Little Rock with his wife, their 1-year-old old son and two cats. Join us at 11:30 a.m. Friday, Jan. 26 as we take a tour of the KTHV Channel 11 newsroom, 720 Izard St., for a behind-the-scenes look at broadcast journalism. The event will include a tour of the newsroom and a sneak peak at their noon newscast. This is a great opportunity to explore the work that goes into not only running a television news station, but also take a glance at career opportunities in the field. Attendees must arrive at the station at 11:30 a.m. Carpooling is encouraged due to limited parking. The tour is expected to last about an hour, then join us for lunch downtown. Here is a link to learn a bit more about the news station: www.thv11.com/about. There is limited space for this event, so an official RSVP will be required. Please email Jennifer Ellis at jellis@arkansasonline.com or Wendy Miller at wmiller@arkansasonline.com by Wednesday, January 24.
or at the door. Guest speaker to be announced. Judges have chosen the finalists in the 2017 Diamond Journalism Awards, a regional competition sponsored by the Arkansas Pro Chapter of the Society of Professional Journalists. The awards recognize outstanding journalism by professionals and students from Arkansas and bordering media markets in Louisiana, Mississippi, Missouri, Oklahoma, Tennessee and Texas. UPDATE: Awards will be presented at 6 p.m. Tuesday, Nov. 14 at the Flying Saucer in Little Rock. Tickets are $10 per person, including heavy hors d’oeuvres and libations. 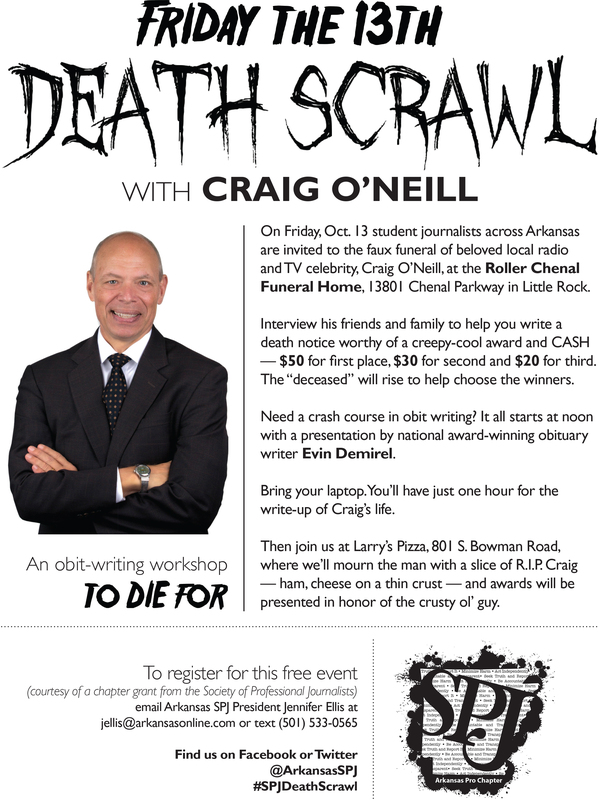 Purchase in advance at arkansasspj.org or at the door. Guest speaker to be announced. Kirstin Pieri May, Arkansas State University; Stephen Thornton, Arkansas Democrat-Gazette. Jacob Kauffman, KUAR Public Radio; Jillian Kremer, Arkansas Online; Brandon Riddle, Arkansas Online. Jackson Carter, University of Arkansas at Little Rock; Staff, Arkansas Democrat-Gazette; Emma Pettit, Arkansas Online. Syd Hayman, Only in Arkansas. Rick Kron, Jonathan Feldman, Garrick Feldman, The Leader, Jacksonville, Ark. ; Jonathan Feldman, The Leader, Jacksonville, Ark. ; David Barham, Paul Greenberg, Walter Hussman Jr., Arkansas Democrat-Gazette. Philip Martin, Arkansas Democrat-Gazette; John Brummett, Arkansas Democrat-Gazette. Rick Kron, The Leader, Jacksonville, Ark. ; Tammy Keith, River Valley & Ozark Edition/Arkansas Democrat-Gazette; Garrick Feldman, The Leader, Jacksonville, Ark. Staff, Arkansas Democrat-Gazette; Noel Oman, Chris Bahn, Arkansas Democrat-Gazette; Andrew DeMillo, Kelly P. Kissel, Sean Murphy, Jill Bleed, Tafi Mukunyadzi, The Associated Press; Thomas Gounley, Springfield (Mo.) News-Leader. Tammy Keith, Three Rivers Edition/Arkansas Democrat-Gazette; Tammy Keith, River Valley & Ozark Edition/Arkansas Democrat-Gazette. Wyndham Wyeth, Arkansas Life; Jordan Hickey, Arkansas Life. Hunter Field, Arkansas Democrat-Gazette; Ellis Widner, Arkansas Democrat-Gazette. Tammy Keith, Three Rivers Edition/Arkansas Democrat-Gazette; Sarah DeClerk, River Valley & Ozark Edition/Arkansas Democrat-Gazette; Sarah DeClerk, Health Beat/Arkansas Democrat-Gazette. Mariam Makatsaria, Arkansas Life; Sarah DeClerk, Health Beat/Arkansas Democrat-Gazette; Jordan Hickey, Arkansas Life. Kara Harnett, Stone Selso, Olivia Moyers, Katelyn Mary Skaggs, Breanne Bleichroth, The Southeast Arrow; Staff, Arkansas Democrat-Gazette; Lisa Hammersly, Brian Fanney, Arkansas Democrat-Gazette. Jeremy Muck, Arkansas Democrat-Gazette; Johnny Carrol Sain, Arkansas Life; Bob Holt, Arkansas Democrat-Gazette. Michael Wickline, Arkansas Democrat-Gazette; John Moritz, Arkansas Democrat-Gazette; Andrew DeMillo, The Associated Press. Mitchell Pe Masulin, Arkansas Democrat-Gazette; Benjamin Krain, Arkansas Democrat-Gazette; Jill Bleed, The Associated Press. David Scolli, The Leader, Jacksonville, Ark. Arshia Khan, Arkansas Life Magazine. Mitchell Pe Masulin, Arkansas Democrat-Gazette; Arshia Khan, Arkansas Life. Arshia Khan, Arkansas Life; Staton Breidenthal, Arkansas Democrat-Gazette; Mitchell Pe Masulin, Arkansas Democrat-Gazette. Bonnie Bauman, Arkansas Life; Morgan Acuff, Little Rock Family; Wyndham Wyeth, Arkansas Life. Jose Gómez, Rolando Ochoa, Univision Arkansas; Andrea Guzmán, Univision Arkansas; Mariana Rivero, Univision Arkansas. Rodolfo Portillo, Univision Arkansas; Karen Pérez, Univision Arkansas; Univision Arkansas. Ann Kenda, Johnathan Reaves, Arkansas Public Media; Bobby Ampezzan, Arkansas Public Media; Jacqueline Froelich, Arkansas Public Media. Jacqueline Froelich, Arkansas Public Media; Chris Hickey, KUAR Public Radio. Jacob Kauffman, KUAR Public Radio; Karen Steward, KUAR Public Radio; Sarah Whites-Koditscheck, Arkansas Public Media. Jacob Kauffman, Chris Hickey, KUAR Public Radio. Kelly P. Kissel, The Associated Press; Hunter Field, Amanda Claire Curcio, Arkansas Democrat-Gazette; Lisa Hammersly, Brian Fanney, Arkansas Democrat-Gazette. Emma Pettit, Arkansas Online; Jacob Kauffman, KUAR Public Radio; Brandon Riddle, Arkansas Online. Andrew DeMillo, The Associated Press; Eric Besson, Arkansas Democrat-Gazette; Tammy Keith, River Valley & Ozark Edition/Arkansas Democrat-Gazette. Lisa Hammersly, Brian Fanney, Arkansas Democrat-Gazette; Staff, KUAR Public Radio and Arkansas Public Media; Frank Fellone, Lisa Hammersly, Arkansas Democrat-Gazette. Emma Williams, The Herald, Arkansas State University; Kimberely Blackburn, Caitlin Jancyz, Delta Digital News Service, Arkansas State University. Kimberely Blackburn, Delta Digital News Service, Arkansas State University. Marie Mitchell, Delta Digital News Service, Arkansas State University; Darcy Hagood, KUAR Public Radio, University of Arkansas at Little Rock; Jiayue Liao, Deltat Digital News Service, Arkansas State University.